As a roofing contractor, you realize the aftermath of a storm can leave many homes with storm damaged roofs and many homeowners worried about finding a trustworthy contractor to install a new roof! Use these 5 tips to build trust and ease worries with homeowners when it comes to repairing their roof. Be active in the community prior to storm season. Distribute door hangers and flies or be active on social media. Be prepared to tell your business story. Provide a firm timeline of roof completion. 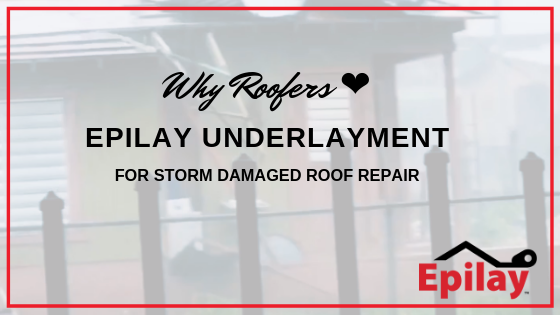 Epilay synthetic underlayment is a favorite among roofers repairing storm damaged roofs. With a 1 year UV protection, this eases roofers and homeowners minds if there should need to be a delay between installing the underlayment and roofing material. Watch our video below to learn more!